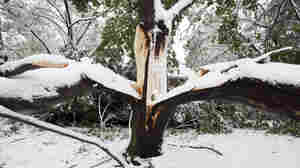 This tree split in two due to heavy snow on its branches in Belmont, Mass. October 31, 2011  That unusually early winter storm that struck the Northeast over the weekend has left many in the dark. It's also forced communities in many parts of New England to postpone Halloween. Some customers may not have power for a week.